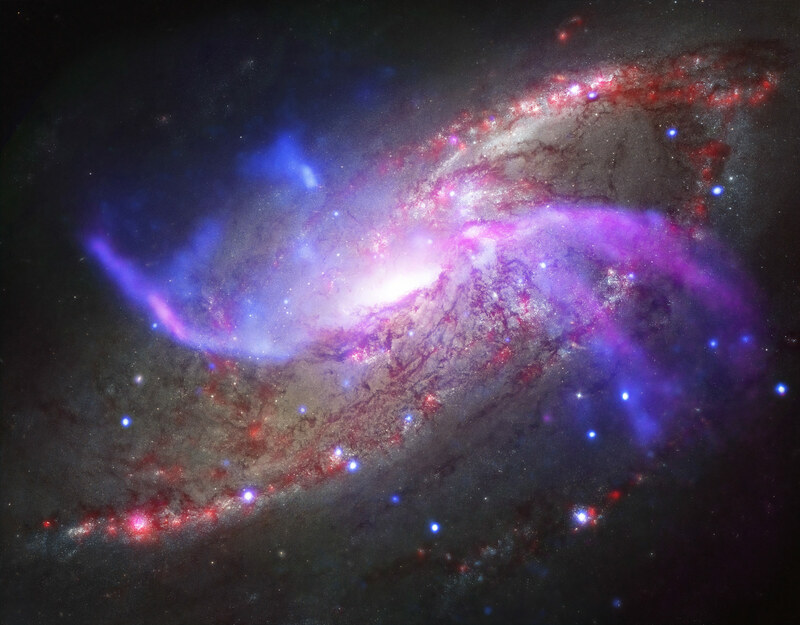 This new composite image of NGC 4258 shows X-rays from NASA’s Chandra X-ray Observatory in blue, radio data from the NSF’s Karl Jansky Very Large Array in purple, optical data from NASA’s Hubble Space Telescope in yellow and blue, and infrared data from NASA’s Spitzer Space Telescope in red. This galactic fireworks display is taking place in NGC 4258 (also known as M106), a spiral galaxy like the Milky Way. This galaxy is famous, however, for something that our Galaxy doesn’t have – two extra spiral arms that glow in X-ray, optical, and radio light. These features, or anomalous arms, are not aligned with the plane of the galaxy, but instead intersect with it. 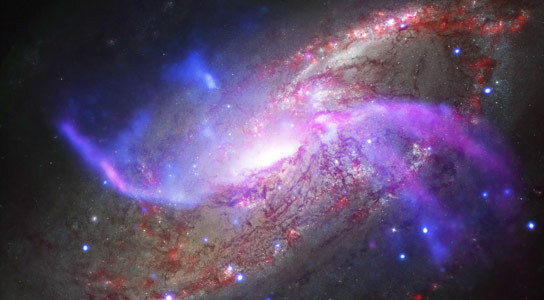 The anomalous arms are seen in this new composite image of NGC 4258, where X-rays from NASA’s Chandra X-ray Observatory are blue, radio data from the NSF’s Karl Jansky Very Large Array are purple, optical data from NASA’s Hubble Space Telescope are yellow and blue, and infrared data from NASA’s Spitzer Space Telescope are red. A new study of these anomalous arms made with Spitzer shows that shock waves, similar to sonic booms from supersonic planes, are heating large amounts of gas – equivalent to about 10 million Suns. What is generating these shock waves? Radio data shows that the supermassive black hole at the center of NGC 4258 is producing powerful jets of high-energy particles. Researchers thinkthat these jets strike the disk of the galaxy and generate shock waves. These shock waves, in turn, heat some of the gas – composed mainly of hydrogen molecules – to thousands of degrees. As shown in our additional, composite image, part of the evidence for this heating process comes from the similarity in location between the hydrogen and X-ray emission, both thought to be caused by shocks, and the radio jets. These results were published in The Astrophysical Journal Letters. The authors are Patrick Ogle, Lauranne Lanz and Philip Appleton from the California Institute of Technology in Pasadena, California. Be the first to comment on "Chandra Reveals a New Composite Image of NGC 4258"